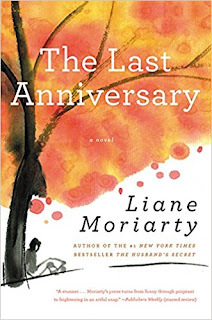 The Last Anniversary by Liane Moriarty is difficult to talk about without giving away too much. It starts out about a 20-something girl, Sophie, who has inherited a house when an ex's elderly Aunt Connie passes away. Sophie's unique outside perspective is perfect for telling the intricate tale of the Aunt Connie's family. The inherited house is on the tiny Australian island of Scribbly Gum. The only other houses on the island are inhabited by other family members, who all run a big festival each year on the island to celebrate the Baby Munro Mystery - the history of Enigma, the baby found just days after her birth by Aunt Connie and her sister. As Sophie moves into her new house, though, Scribbly Gum island may be preparing to celebrate the anniversary for the last time. 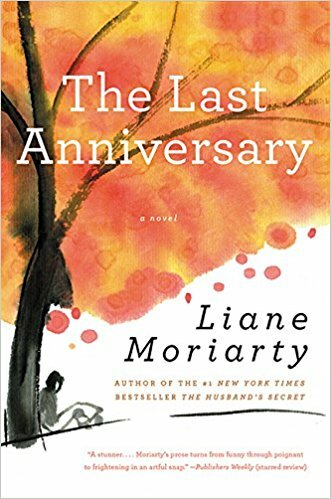 I loved Liane Moriarty's characters again, and I loved to fantasize about living on the quaint little island with them all. The plot twists and other discoveries were very entertaining, . From dealing with love lost, what to do about one's biological clock, finding 'Mr Right,' and post-partum depression, all the way to solving a random murder mystery on the last page, this book kept me reading and interested to find out how the stories ended for them all. I would definitely recommend this book. Sounds interesting. I have a stack of books just waiting to be read, so I wont be adding anything new for a while. But this does sound like something I'd like to read one day. This is quite an interesting book to read. Would love to check this out pretty soon. Thanks for sharing. I've never heard of this one. I still haven't finished Truly Madly Guilty. I enjoyed all the books Claudia gave me in the Fall. This one particularly was an interesting twist.